Starter blanks for the .22 caliber starter pistol. These blanks are available in two different styles the CCI .22 short noise blanks or the .22 acorn crimp blanks. Each package includes 100 blanks. 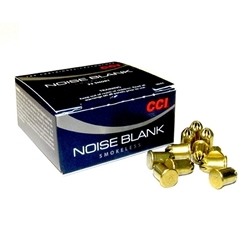 The CCI .22 short noise blanks have a medium loud sound and uses smokeless powder. The .22 acorn crimp blanks have a softer bang that is good for smaller venues, these blanks also use the smokeless powder. Due to the smokeless powder these blanks may be used for track and field practice, but may not be suitable for actual events.